Young pumas stay with their mother until they are about 18 months old, in which time they grow from 5 pounds to 70 pounds (females) or 90 pounds (male). Overall, there tend to be equal numbers of male and female cubs born. We’ll say here that a typical female puma is considered an adult at 2 years old, and a male puma is considered an adult at 3 years old, because by those ages they seem to have adopted typical adult behaviors. Puma territories. Large shapes are males. 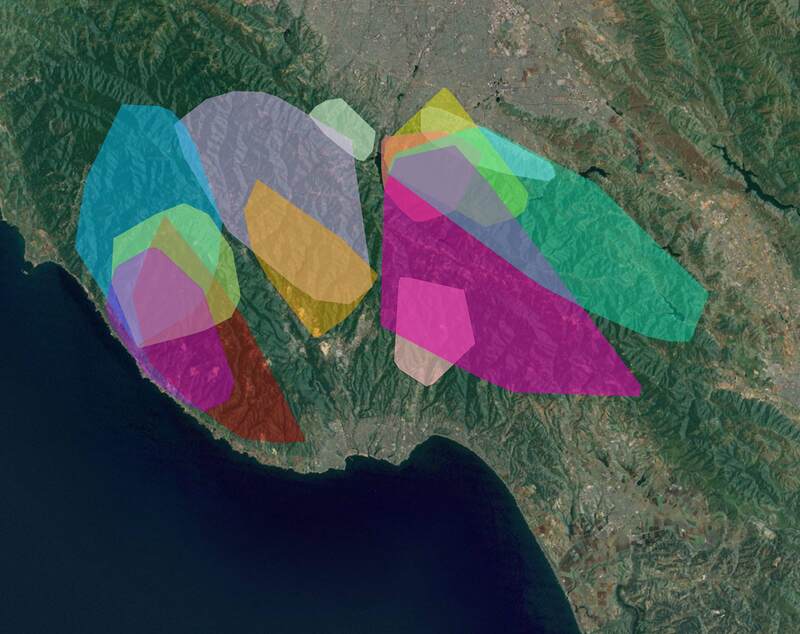 Small shapes are females.San Jose is the gray area at the top. Pumas can mate any time of year. Because of this, the grown cubs can also leave their mother any time of year. However, in the Santa Cruz Mountains there is a seasonal spike in the birth of puma cubs and a corresponding seasonal spike in cubs that leave their mothers. That spike in dispersing young pumas happens in Spring. Adult pumas are territorial. 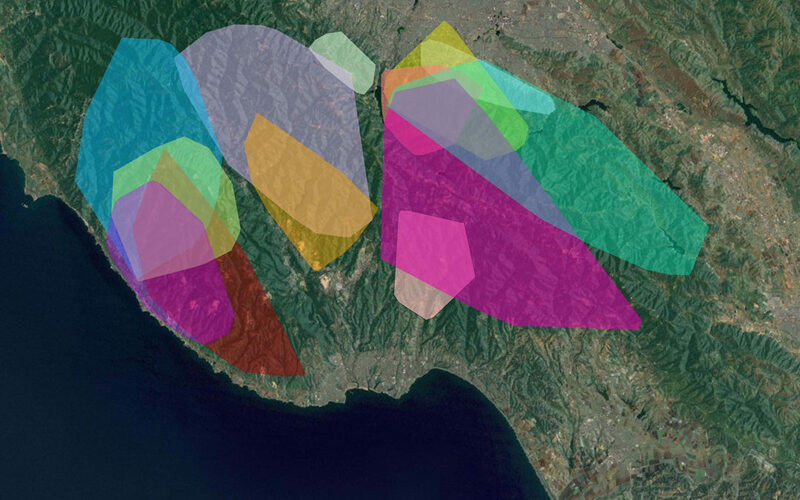 Our GPS collar data shows that male territories in the Santa Cruz Mountains average ~90 square miles, and female territories average ~40 square miles, and a male’s territory will overlap with 3-4 females. Said another way, there are ~3 adult female pumas for every 1 adult male puma. Adult female pumas tolerate young females better than adult male pumas tolerate young males. Young females tend to travel a fairly short distance from where they grew up and form their own territory in a suitable place within just a few months. Adult males – who may weigh 130 pounds and have years of experience – persecute comparatively scrawny young males that are novices and weigh just 95 pounds. It takes 1 or 2 years for a young male to gain the experience and pounds of muscle to maintain his own territory… …if he can find one. Adult males tend to like remote places with fewer people, which means that the safer places may be closer to people. All of this adds up to create a lengthy journeying phase in the life of young male pumas. They leave their mothers and start to wander in search of a place without an adult male puma and then seek to keep a low profile while they grow in size and experience. Adult pumas have their territories and don’t venture much outside of them, but these young pumas explore new places. Pumas are stealthy and so they prefer to travel near the cover of forests and brush. Streams and forests are easy places for them to move and look for deer. Pumas are active mostly at night (which happens to be when people aren’t), and it sometimes happens that a puma follows one of these streams or forests right out of the hills and into a quiet neighborhood at night, only to have it turn into a noisy, busy place of human activity once the sun comes up. So, the puma tries to lay low and find its way back out the next night. Sometimes he can stay unseen for a couple of days. When seen, these pumas aren’t likely acting aggressively. They are more likely waiting for darkness or seeking a way back to the quieter forests. All the cases of young pumas wandering into local cities that we’ve observed involve young males. It’s a tough road for these young male pumas, and many of them die. In open wilderness such as the Sierra Range or Big Sur, we may expect that adult males would eventually find and kill them. In the Santa Cruz Mountains, however, run-ins with people are frequent causes – the most common being killed by cars while crossing busy roads or being shot for being making an easy meal of small livestock. Still, a few of them get a paw-hold in the more remote forests, find a vacant territory, and survive to adulthood. 46M – The young male puma that famously wandered into downtown Mountain View in May, 2014. Add to that list now 56M – the puma that was caught yesterday in San Mateo. 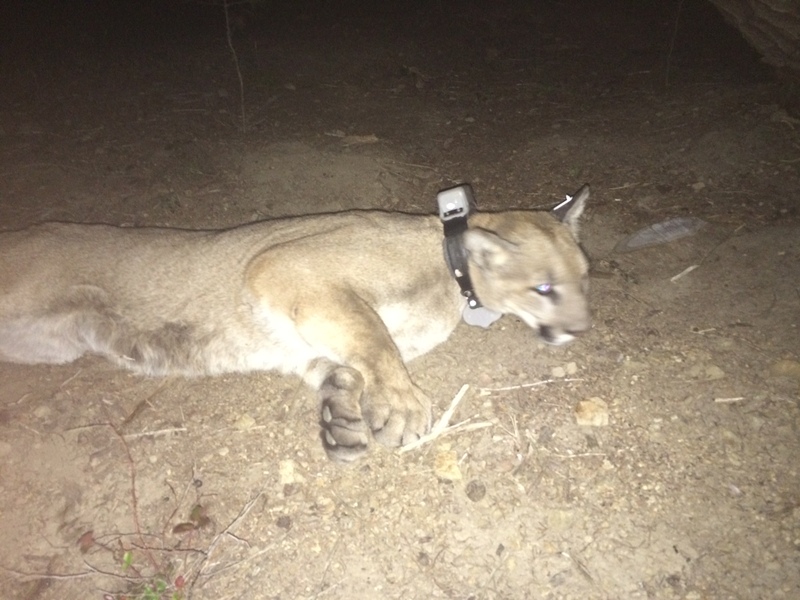 We met with California Department of Fish and Wildlife wardens at the release site and put a GPS tracking collar on him so that we may continue to learn about this important group of young pumas, the young males. Why are young male pumas so important? 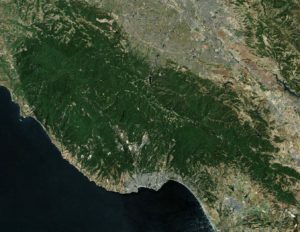 From an animal’s point of view, it’s possible that the Santa Cruz Mountains are cut off from the nearby mountain ranges. Think about it – the mountains west of San Jose, Palo Alto, San Mateo are all surrounded by water: San Francisco Bay, the Pacific Ocean, or Monterey Bay. 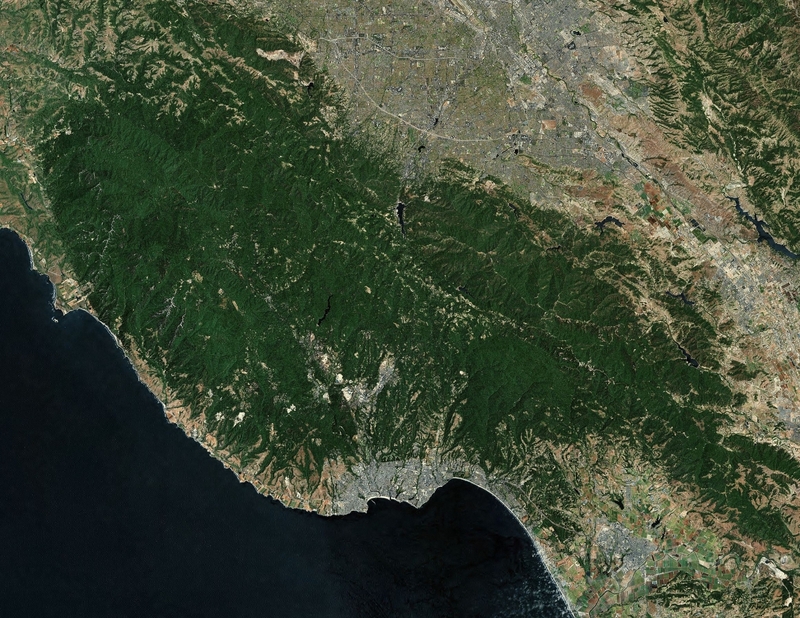 There is a narrow area between San Jose, Gilroy, and Watsonville that connects this wonderful mountain range to the rest of North America. But, it’s hard for pumas to move through this area because there are many human influences that pumas stay away from – Highway 101, residential communities, and vast areas dedicated to farming tasty berries in the Salinas Valley. Since adult pumas have territories that they stay in, and young female pumas tend to move only a few miles from where they are born, it is up to the journeying young males to try and make it across to the neighboring mountain ranges. Can they do it? And, what happens if they can’t? When animal populations become small in number and isolated from each other, over time relatives begin to breed with each other and strange genetic abnormalities surface that affect the animals. This can make it harder for those affected individuals to survive or they may have fewer cubs, and a spiraling decline can occur. Allowing animals to move between those isolated populations can prevent this, but that takes planning and prioritizing by people amidst our other activities like housing and road construction, farming, and other choices about how land is used. An important piece of continuing to have pumas in the Santa Cruz Mountains long into the future is to ensure that they stay connected to their neighbors in nearby mountains and do not become isolated. Putting GPS tracking collars on young male pumas can show us if they are able to get through these areas and if they are, where those places are located. So far, none of the males that have tried have made it across. We will continue putting tracking collars on these young pumas to see if – and where – any make it through. Maybe the San Mateo Puma – 56M – will make it through? Check in with the blog again later. We’ll post an update on his progress.